Rush skeletonweed is a perennial forb with many branched, wiry stems that range from 1-4 feet tall. They have few leaves when in bloom, and have coarse, red, downward-pointing hairs at the base of the flowering stem. In the spring, rosette leaves resemble common dandelion and are hairless with deep, irregular teeth that point back toward the leaf base. Leaves produce a milky white juice when torn. Rosettes generally wither by flowering time. Small, yellow flower heads are a ½ inch in diameter and appear in early summer, growing in leaf axils and stem tips in singles or in clusters. They have 7-15 yellow ray flowers and 2 rows of green flower bracts at the base of the flower head. Seeds are 3mm long with a ribbed surface and white bristles on one end that aid in wind dispersal. In the spring, rush skeletonweed rosette leaves resemble common dandelion and are hairless. The flowers are also very similar to dandelion and dandelion-like plants. Rush skeletonweed thrives in well-drained, sandy or gravelly soils and has invaded extensive areas of shallow silt loam soils. It is found in pastures, rangeland, along roadsides, railways, and in open and disturbed areas. Without control measures, this weed will produce a monoculture of interconnected plants. A single plant can become an entire colony. Rangeland infestations displace native and beneficial forage grazed by livestock and wildlife. A pulled rush skeletonweed with robust taproot. These three species in the Onagraceae (evening primrose) family, Ludwigia grandiflora, L. hexapetala, and L. peploides ssp. montevidensis are very similar and difficult to tell apart. All three species have bright yellow flowers with 5 petals that are about an inch wide. The reddish stems root freely at the nodes. The leaves are alternate, elongated, and willow-like, although they are more oval on young plants. They were introduced through the aquatic plant trade and spread through seeds, and root and stem fragments. Large-flowered primrose willow (L. grandiflora) stems can be up to 10 feet long, while primrose willow (L. hexapetala) and water primrose (L. peploides) stems only grow up to 6 feet. These plants can sometimes be confused with water purslane (Ludwigia palustris), which has small and inconspicuous green flowers and opposite leaves. They can also be confused with other yellow-flowered streamside plants such as the natives monkey flower and stream violet. However, upon closer examination, the flowers and leaves are quite different. To distinguish among these three non-native Ludwigia species a DNA test is often required. Water primrose and the primrose willows are aquatic plants that grow in still or slow moving water such as wetlands, ditches, sloughs, ponds, and lake margins. Ludwigia species forms dense mats that clog waterways, and this can interfere with water recreation, irrigation, fish passage, and flood control. When it clogs waterways, it also reduces the amount of oxygen in the water which can make it hard for other plants and animals to survive. As this species can out-compete other species, it can reduce the diversity of plants, and reduce the available habitat for birds and fish. It can spread and reproduce through leaf and stem fragments, as well as seeds, making control extremely difficult. Since 2016, the WeedWise program has been working to control the largest known infestation of goatsrue (Galega officinalis) in Oregon. Goatsrue is an Oregon class A noxious weed and has been deemed a high priority for control and eradication because it is toxic to livestock and spreads easily. This federal and state noxious weed is only known at a handful of other sites across Oregon and the Pacific Northwest. 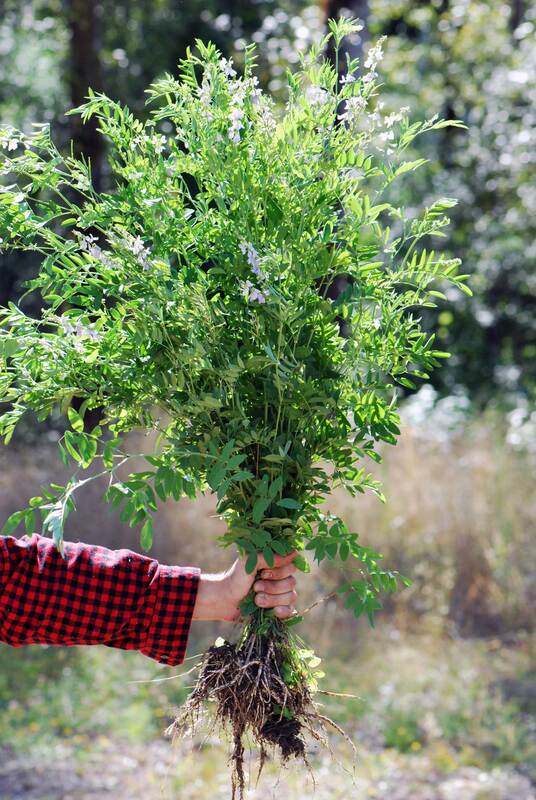 Goatsrue is a deep-rooted perennial, with hollow stems and compound alternate leaves. The compound leaves have a terminal leaflet and 6-10 pairs of leaflets. The tip of each leaflet rapidly narrows to a fine tip. Goatsrue has pea-like flowers that vary in color from purple to white. Flowers bloom from June to October and are clustered at the end of its branches or at the leaf axils. Unlike some other members of the pea family, goatsrue lacks tendrils and grows in a more upright and bushy form rather than as a vine. The seeds are contained in pods with up to 9 mustard-colored, oblong seeds. Each plant can produce 15,000 pods a year. Additionally, these seeds may remain viable for 5-10 years in the soil. Goatsrue closely resembles some regionally rare native plants, so we encourage landowners to contact us if they think they may have goatsrue on their property. 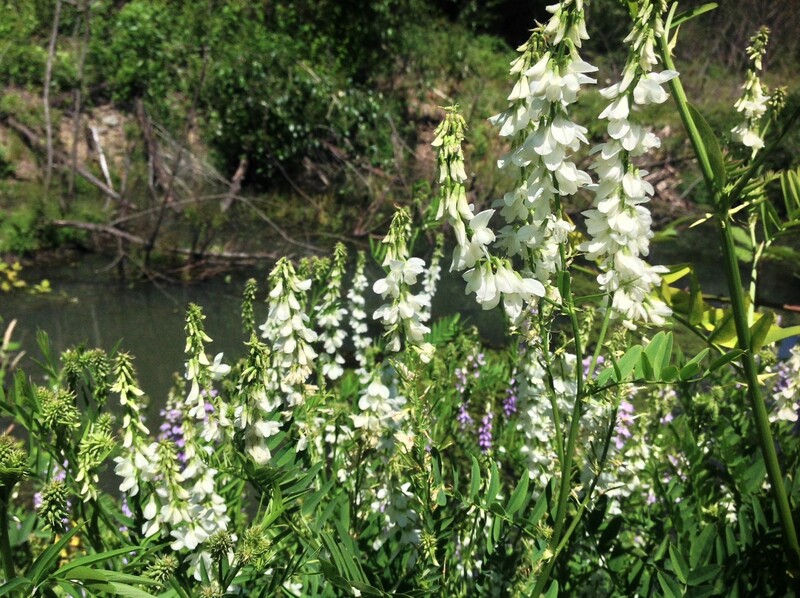 In May of 2016, during one of our planned weed surveys, one of our contracted survey crews discovered a large previously unknown population of goatsrue on two adjacent riparian properties along the Clackamas River. This infestation affects 14 acres and is the largest known infestation of goatsrue in Oregon. 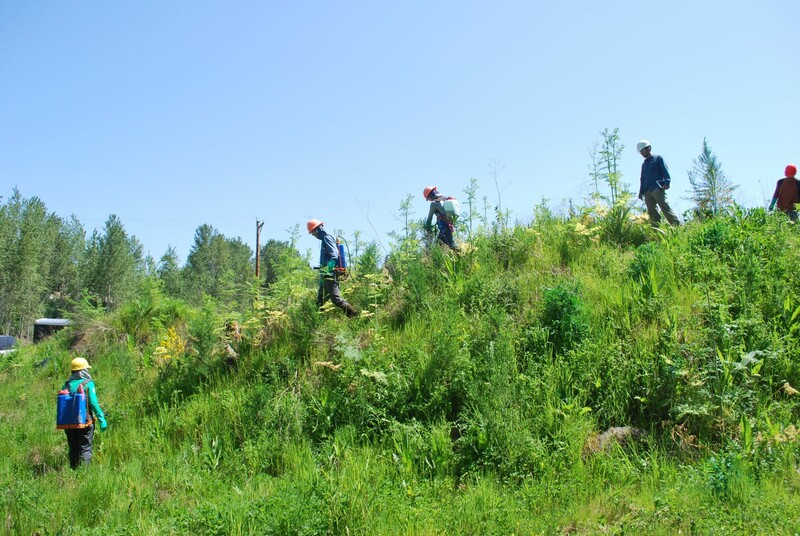 At that time, we began a management effort to contain and control this priority weed with the goal of eradication of the goatsrue as well as several other priority invasive plants present at these sites. This discovery was found as part of extensive surveys of streamside properties along the Clackamas River initiated in 2015 and continuing into the present. Twenty-one priority invasive plant species were on our target list for these surveys. Some of these species had been documented in our region and some had not. These surveys help us to address new priority invasive plants and better manage priority invasive plants established here. We thank private landowners for allowing us to access their properties for these surveys! The WeedWise Program initiated control soon after detection of this large infestation. Our approach began confirming the identity of the goatsrue. We then followed up with a thorough review of the biology and control of goatsrue. Most notably, we learned that goatsrue can have a long seed dormancy period allowing seeds to grow after 10 years in the soil. As a perennial weed with a deep taproot, it is all difficult to remove by hand. Therefore, our management goals were to prevent all seed production and to target the large root systems of existing plants. Next, we researched management strategies appropriate for this plant and this site. 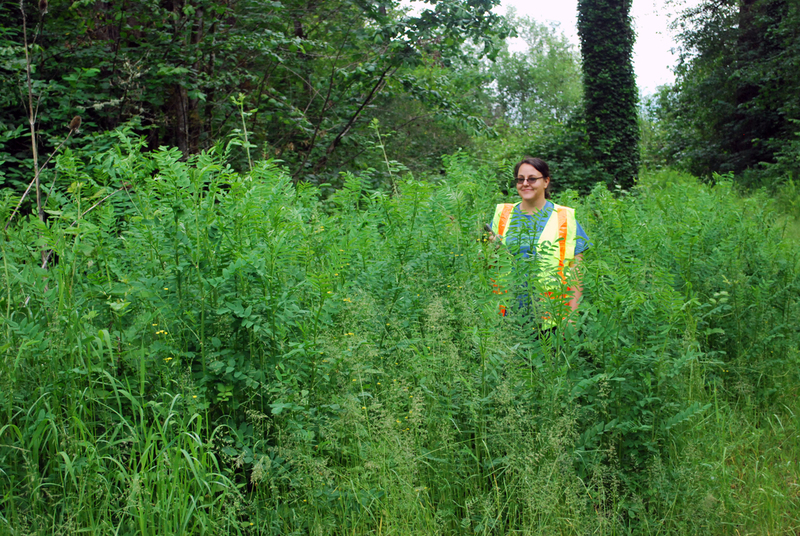 We also consulted with the Oregon Department of Agriculture Noxious Weed Control Program and the City of Portland Bureau of Environmental Services who both have prior experience managing goatsrue. Based on this research, we selected two herbicides to treat the infestation: one to target upland populations and a second aquatically approved herbicide to treat infestations that occur near water. The herbicide applications were planned by the WeedWise program and implemented using licensed restoration contractors. To date, our management efforts have been highly successful, but with the size and complexity of the site we did note some patches with regrowth after herbicide application, as well as new seedlings emerging. On follow-up monitoring of the site, we also found several overlooked patches that had grown in an among other vegetation. In response, our current efforts focus on continuing to scout for missed populations and to remove interspersed invasive Himalayan blackberry (Rubus bifrons) stands which may obscure goatsrue plants. We are carrying out multiple rounds of control each year to ensure that we are not letting any plants go to seed and to continue to address regrowth. After two years of intensive control, we have dramatically reduced the populations and are on track to eradicate this population. Eradication will require ongoing monitoring and control to address the long seed dormancy. Although we won’t be walking away from the site anytime soon, we are optimistic knowing that the population is significantly reduced, and that we are committed to eradicating goatsrue from Clackamas County! Goatsrue growing along the edge of a small pond. Goatsrue growing in an opening within the floodplain of the Clackamas River. Meadow hawkweed is a perennial in the Asteraceae (sunflower) family. The stem and leaves contain a milky juice. Flower heads are yellow, dandelion-like, and grow in clusters of 5 – 30 at the top of the stems. Each plant can produce 10 – 30 flowering stems. The bracts below the flowerheads are covered in black hairs. The clustered buds are rounded and also covered in black hairs. The leaves are mostly at the base of the plant and are hairy with edges that are either smooth or very minutely toothed. It can spread by seed, rhizome, or stolon. At first glance, meadow hawkweed looks like a common dandelion (Taraxacum officinale) or even a false dandelion (Hypochaeris radicata). However, on meadow hawkweed, the flower heads are more clustered, the buds and stems are covered with black hairs, and the leaves are not lobed like the dandelion and false dandelion. Identification between meadow hawkweed and some of the other hawkweeds can be extremenly difficult, although the above-ground stems and virtual lack of leaves on the stem (occasionally 1-2 small leaves) are helpful characteristics to narrow down the options. Meadow hawkweed prefers sunny areas, although it can be somewhat shade tolerant. It grows well in low fertility soils and is well-adapted to higher elevations. You can find this plant in meadows, woodlands, fields, and disturbed sites like roadsides, pastures, and gravel pits. Meadow hawkweed is an aggressively invasive plant that spreads easily and can form monocultures. It out-competes other plants for water, nutrients, and physical space. Its decaying leaves contain chemical compounds that can harm other plants. Flowering rush is an aquatic perennial plant in the Butomaceae family. Leaves are thin, and either straight or slightly twisted, up to 40 inches long, and have a triangular cross-section at the base. When the plant is submerged the leaves are flexible, and when emerging along the shoreline, they are more stiff. Flowers have 3 large pink petals (with three sepals below that look like petals), and grow in flat-topped clusters of 20-50 on tall cylindrical stalks. It has fleshy rhizomes that trail along the ground (??). It was introduced as an ornamental and is sometimes still sold for water gardens. It spreads mostly through rhizome fragments or small bulbils that detach and disperse through the water, though some varieties also produce seeds. Flowering rush requires wet soil and sunshine. It can be found in wetlands, irrigation ditches, shorelines, and along slow-moving streams and rivers, and it can grow in water up to 9 feet deep. It often grows in areas with fluctuating water levels and can tolerate a wide variety of temperatures. Flowering rush is an aggressive colonizer that can out-compete native wetland and shoreline vegetation. It can clog slow moving waterways and impede boat travel and fishing along shoreline, thus degrading both their recreational and ecological value. As an aquatic plants that spreads vegetatively, it is difficult to control, and can be easily spread by waterfowl, wildlife, and boaters. Houndstongue is a member of the Boraginaceae (Borage) family. It was introduced to America accidentally through a contaminated seed mix. All parts of this plant are hairy. The leaves are alternate, rough, lacking teeth or lobes, and are 1-12 inches long. The flowers grow in long, coiled clusters at the end of the branched stems and have 5 lobes. It reproduces exclusively by seed, and one plant can produce hundreds of seeds that grow inside groups of 4 nutlets and are covered by hooked barbs. Houndstongue looks similar to other species in the borage family such as bluebell and bugloss species species (Mertensia spp.and I spp. ), which both have blue flowers. It also looks a bit similar to common mullein (Verbascum thapsus), which has yellow flowers and much fuzzier leaves. Houndstongue often grows in shady forest understories and pine woodlands, but can also do well in grasslands, pastures, meadows, and along roadsides and other disturbed areas. It grows best in coarse, sandy soils, but can also do well in wetter grasslands. Houndstongue is a highly invasive plant, especially in eastern Oregon. It can reduce the value of forage and competes with both native and desirable grasses. It’s seeds have hooked barbs that can reduce the value of sheep wool, cause physical damage to animals, and also allow it to easily spread by cattle and wildlife. Furthermore, this plant is toxic to humans and livestock. Oblong spurge is an escaped ornamental in the Euphorbiaceae (Euphorbia) family. It has a branching stem that produces up to 20 stems from a woody rootstallk. The leaves are alternate, hairless,finely toothed, somewhat oblong and egg-shaped, and up to 2.6 inches long. The flowers are very small and yellow, and they grow in clusters surrounded by yellow-ish green bracts and leaves. The stems contain a milky, latex sap that can cause skin irritation. The seeds have a sticky coating and can eject several feet. The plant spreads mostly by seed, but also through root fragments. Oblong spurge looks similar to other Euphorbia species, especially leafy spurge (Euphorbia esula) whose leaves are more narrow. Oblong spurge does best in moist soil conditions, but can grow in a wide variety of habitats including damp meadows, pastures, stream banks, shady woodlands, roadsides, and disturbed areas. Oblong spurge can form dense stands that out-compete native plants, thus reducing plant diversity and habitat. The stems also contain a toxic milky sap that can irritate skin and internal soft tissues of livestock when ingested. Giant hogweed is a distinctively large, escaped ornamental in the Apiaceae (carrot) family. The hollow stems have reddish-purple spots, are covered with bristles, and are 2 – 4 inches wide. The leaves are sharply and deeply cut and can be 5 feet wide, while the white flowers grow in flat-topped clusters that can be 3 feet wide.The plant spreads by seed, producing anywhere from 5000 to 100,000 seeds per plant. It takes 3-5 years to produce flowers, and is monocarpic, which means the plant dies after it flowers. Giant hogweed looks extremely similar to the native cow parsnip. When mature, giant hogweed is larger than the native cow parsnip that only grows 6 feet tall with flower heads that are 8-12 inches. However, before maturity, the distingishng features are subtle and relative to each other: the purple spots on giant hogweed are more raised, the hairs on the leaf underside are shorter, and the leaves are more deeply cut. Giant hogweed is somewhat shade tolerant and prefers moist soils. However, it is also grows well in full sun. Escaping cultivation by seed, this plant can be found in backyards, grasslands, ravines, parks, vacant lots, streamsides, woodlands, and roadsides. Giant hogweed has a clear sap that is photo-toxic, which means skin contact followed by sun exposure can cause severe, painful blisters that can leave dark scars (contact with the smoke from burning the plant has similar effects). It is a prolific seeder, and the seeds can float in water up to 8 hours. Furthermore, it can out-compete native plants and invade stream areas. Orange hawkweed is a highly invasive perennial in the Asteraceae (sunflower) family. With the exception of 1 or 2 stem leaves, the leaves only grow at the base and are narrow, hairy and grow up to 5 inches long. The pretty flowers are bright orange-red and grow in compact clusters of 3 to 12 flower heads that are each about 1 inch in diameter. It can spread by seed, rhizomes and its fuzzy, above-ground runners (stolons). Before flowering, orange hawkweed is extremely difficult to distinguish from other hawkweeds. However, once it flowers, the bright orange-red color is a dead giveaway. Orange hawkweed can thrive in a variety of soil conditions, and while it prefers sunny locations, it is also somewhat shade tolerant. It can be found in lawns, flower beds, meadows, pastures, roadsides, gravel pits, forest openings, and is well-adapted to higher elevations. Orange hawkweed can spread rapidly and aggressively, forming mono-cultures and crowding out desirable species. It is sometimes sold as an ornamental plant in nurseries. Yellow archangel is a fast growing perennial plant in the Lamiaceae (mint) family. It is often planted as an ornamental in residential areas, but it easily escapes and invades natural areas. It is evergreen to semi-evergreen and typically trailing or growing over other plants. The flowers are small, yellow, and they grow close to the stems. The leaves are opposite, hairy, often variegated with silver-gray marking, and the margins are toothed. The stems can root at the nodes, and as a member of the mint family, the stems are also square. It spreads by seed and stem fragments. Yellow archangel looks somewhat similar to goutweed. However, the variegation on goutweed is typically closer to the margins and it has white flowers that are smaller than those of yellow archangel. Yellow archangel grows well in full sun to full shade, in a variety of soil types, and in dry or moist sites. It can be found in ravines, forested parks, residential areas, and greenbelts. Yellow archangel can form extensive mats of ground cover, which out compete native species. These mats provide poor food and cover for wildlife. Its above-ground stems can grow 3 feet per year, giving it an advantage in finding light resources. Disturbance seems to stimulate plant growth.